I suppose disappointment is somewhat universal. I am reminded of this every time I eat cheese in front of the dog and give him none. Not sure if that’s a compliment OR a really cruel and vicious insult. This may take copious coffee to contemplate. I’m not familiar with the definition of “good” that relates to the verge of having your throat ripped out and head punched off. The “good” is in not crossing beyond that verge. Hwan showed great control there. Notice how his defenses didn’t kick in with Bikke. 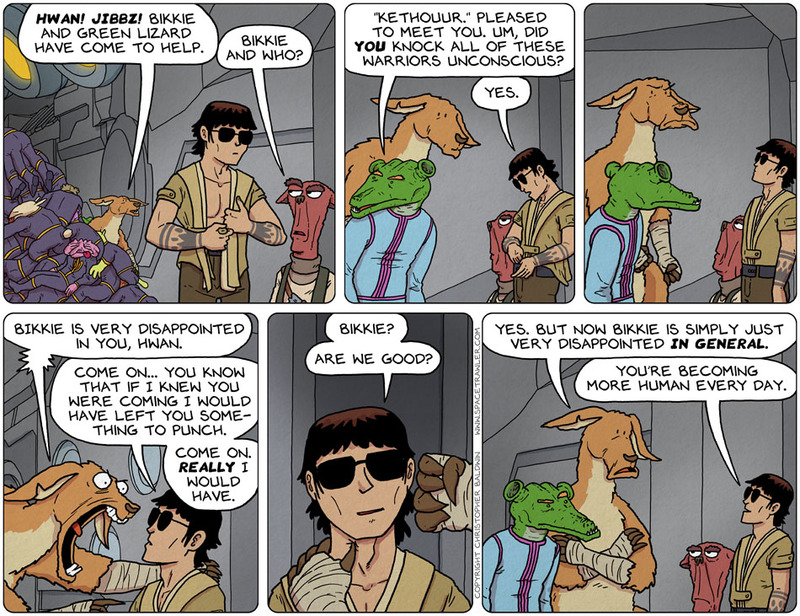 Bikke is widening a little as a being and he just didn’t punch his way to an answer. And Hwan is a formidable opponent too. Bikke might have lost over nothing. Bikke is and Hwan have grown here. Very nice. And the fact that Hwan didn’t kill anyone even though he was outnumbered is also a model of restraint. BTW, a Boxing Kangaroo is meant to box with it’s Paws not it’s claws. Kinda like a T-rex boxing. Um… who don’t you give your dog a small piece of cheese? What happens if you do? I thought cheese is bad for dogs? Very nice touch with the indentation around Bikkie’s thumb-claw. Subtle yet… poignant. ‘More human’ or simply ‘more Earthly’? I get the impression there’s a general sad-sack nature to every terrestrial life-form, no matter how proficient in martial arts. Cheese never harmed any of my dogs – or cats. Of course, I never gave them (or myself) Limburger, either. Whenever I have a treat; I try to make sure I have treats everyone can share. Otherwise i don’t eat my treat in front of those who have not. Just give the puppy something they can eat too!